Kampurrula is the name of both a bush raisin and a site in the Henty Hills, 180 kms west of Papunya and both are celebrated in this painting. 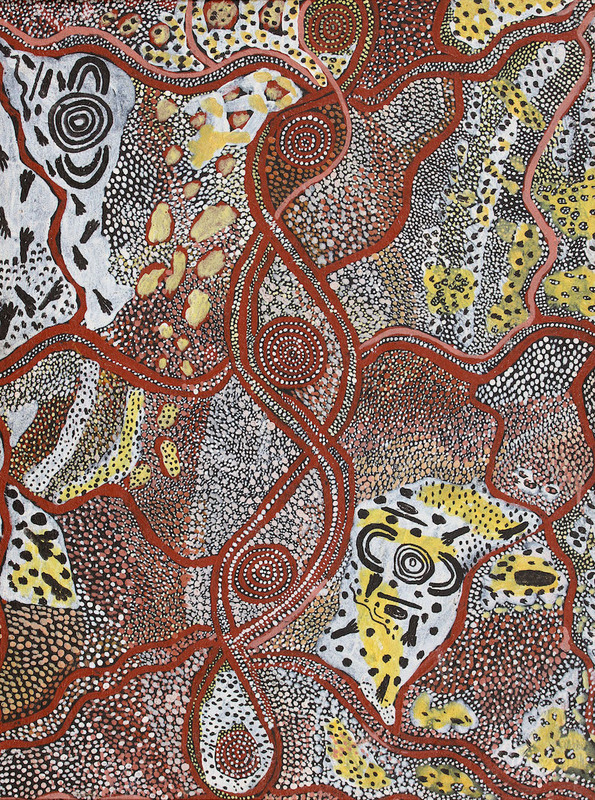 The current work, painted in May 1973, demonstrates Warangula’s mastery of the dot to evoke desert vegetation. Perfected earlier, when interpreting the Storm Dreaming site at Kalipinypa,¹ here, Warangula creates a dense mosaic of dotted patches to establish the environment within which a group of ancestral women made their camp, having found respite from the relentless pursuit of ardent men. ¹. Judith Ryan, 'Aesthetic splendour, cultural power and wisdom: early Papunya painting', in Tjukurrtjanu: Origins of Western Desert Art, Melbourne, National Gallery of Victoria, 2011, pp. 24- 26. To download the catalogue essay, please click here.